Looking for a camp that is breathtaking in natural beauty, strives to create a safe community, and encourages campers to explore the world around them? General Activities available at Camp Westwind include: canoeing, kayaking, paddle-boarding, bellyacks, archery, challenge course, arts and crafts, disc golf, beach games, and many more. All of Camp Westwind’s campers come together during our unique and exciting evening activities such as capture the flag, The Amazing Race, Beach Dance party, all while building camper teamwork and leadership skills. No week at Camp Westwind is complete without the traditional campfires, songs, hikes and Camp Outs! Come spend the summer with us and watch your child grow! 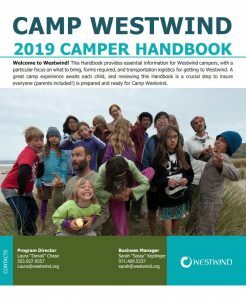 During Westwind’s Teen Adventure, campers choose from action-based activities, service projects, and overnight adventure excursions to beautiful locations around Westwind’s 529 acres. Kayaking, archery, arts and crafts, nature exploration, challenge course, two night overnight, hiking, paddle-boarding, and team building are just some of the activities that round out your campers Teen Adventure Program. From these experiences, campers find in themselves newfound confidence and strength. They learn how to trust in themselves, and each other, as they work together to explore, problem-solve, and achieve common goals. An empowering experience for all! Click here to register. Teen Trekkers is sure to be an exciting week at camp! Taking the adventure to the next level doing daily trekking to off-site adventure, high ropes course, river rafting, snorkeling, and surfing along with all the other loved camp activities. Campers will start each day at Westwind, leave after breakfast for the daily trekking and be back for dinner and evening programming. The emphasis for Teen Trekkers is on of building confidence, teamwork, problem-solving and independence while strengthening the bond of friendships utilizing the amazing 529 acres of Westwind and expanding into the coastal community. Click here to register. The TL1 program fosters and develops group dynamics, problem solving, and the camping skills we look for in future staff members. While living at camp, campers participate in the main camp activities and programs while focusing on their leadership skills and program development. This training is a stepping stone for older campers who are interested in transitioning into future camp leaders, but still enjoy the magic of being a camper. It is preferred that Teen Leadership 1 campers have completed a session of Teen Adventure. Click here to register. Teen Leadership 2 registration will be open to applicants who are selected after completing an application and interview. Typically, there are 12-14 spots for the Teen Leadership 2 camp. This two week program is a wonderful opportunity to enhance and develop self-confidence, self-awareness, communication skills, tolerance for adversity, and personal leadership style. Your training as a TL2 will begin from the time you step on to the ferry where you will become comfortable and confident with your skills. This is an endless opportunity to be a positive role model and to make new friends. We ask you to push yourself and experience wonders you have never imagined! This progressive program provides opportunities for constant feedback and individualized training for those interested in becoming a future Camp Westwind staff. Teen Apprentice registration is open on an individual basis after the camper has completed an application, been interviewed and is extended a spot in the program. Applicants need to be 16 years old and it is preferred that they have completed Teen Lead 1. Applications will be available by December 1. Grades 11 and higher, by invitation, application, interview and acceptance only. For one session of camp get a hands on glimpse of what working at camp is all about. On the first day of the session sit with the Teen Apprentice Coordinator and develop your schedule for the week based on your program interests. Teen Apprentices have a choice between; waterfront, naturalist, arts & crafts, media & technology, and special camp programming. Apprentices will have time to shadow a cabin counselor to gain experience working with children and facilitating activities. Applications due March 1 for priority consideration. Apply now!